UNLIKE OTHER SYSTEMS, we provide you with 2 months of free sim card operation and after that date, for less than 15c per day, we can continue to automatically keep your sim card active. Flexible payment options available. Other companies only provide you with one-month free sim use and then you have to go to a lot of trouble to acquire your own sim card at a greater cost. 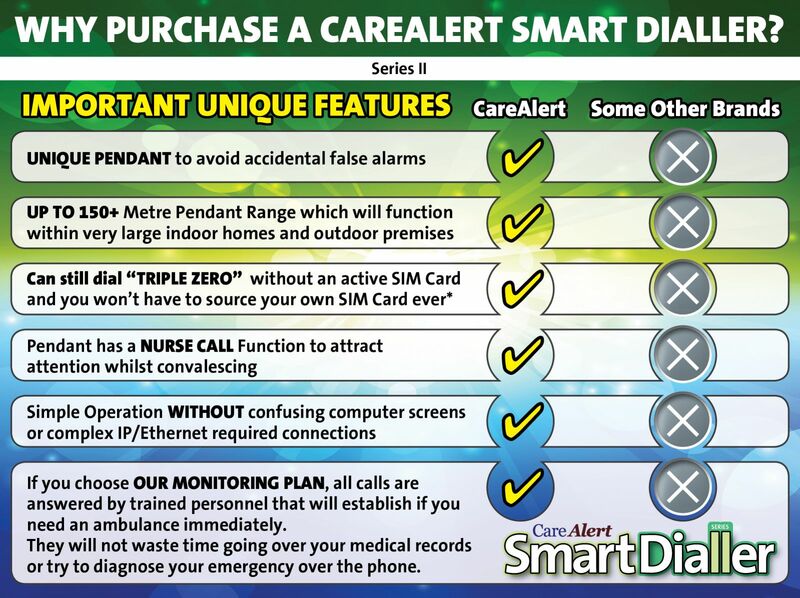 A sim card is now an essential component for all medical alarms where the landline will eventually be disconnected. 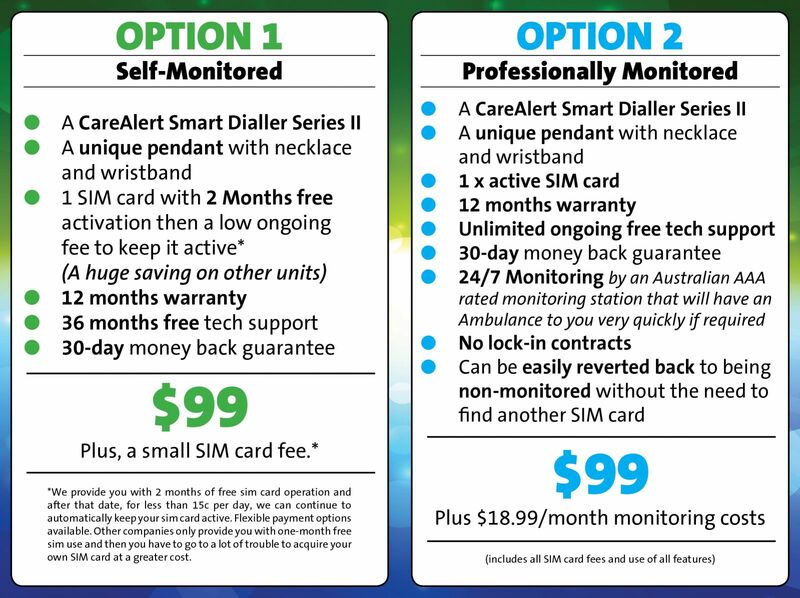 It allows your personal alert system to be able to use the mobile network to make an emergency call without a phone service provided over the nbn™ broadband access network or Landline. ITS ALL ABOUT KEEPING IT SIMPLE: CareAlert are the largest selling non-monitored system in Australia. WHY? Because our device is so simple to operate, which is extremely important. Many other systems are confusing, they offer so many features you will never use and can be very complicated for the elderly. The last thing the elderly want or need is a confronting computer screen with bells and whistles that will frighten them into not using it. OUR UNIQUE PENDANT SAYS IT ALL, not only is it fully waterproof BUT it has dual activation buttons making it almost impossible to cause a false alarm. This has been one of the biggest selling features of our product. 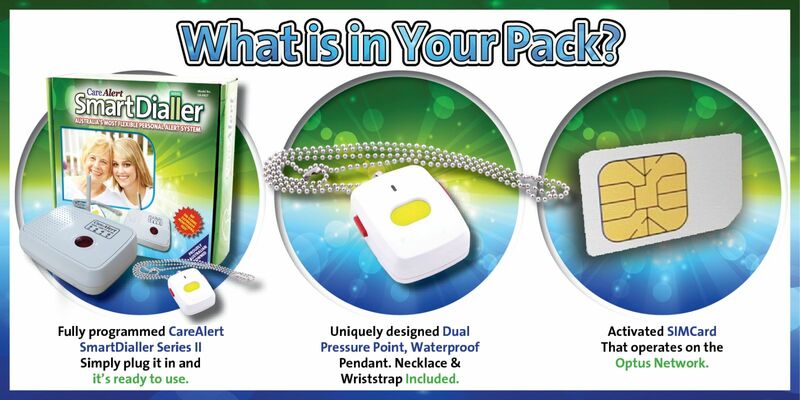 One single button activation pendants have caused so many false alarms. Our pendant also has a unique nurse call button to attract attention if you are convalescing at home. an emergency even if you have no sim card or an expired one*. This could be a lifesaving feature! No confusing complicated computer screens with flashing lights and puzzling commands. *Please note, Triple Zero calls made over the mobile network can only be successful if mobile network coverage is available. 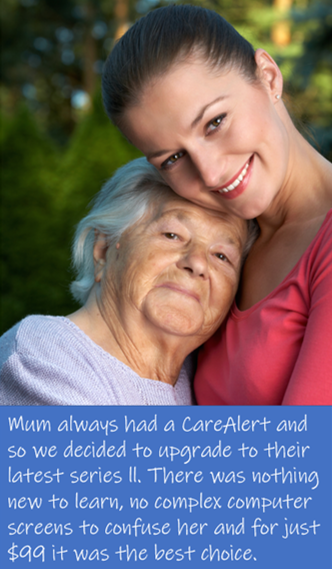 If you already have an existing CareAlert, then this upgrade will be the best option, as its functionality is similar to the tried tested and proven function of your existing device. Once you have received your letter of approval from nbn™ please call CareAlert on 1300 75 85 95 and we will take care of the rest.